Crispy but tender squid with a hum of pepper heat, complemented by fragrant herbs, crispy garlic and a hit of vinegar – this is my evolution of the classic dish, which I know you guys all love. Traditionally, it comes from Cantonese cuisine, originating in the Guangdong province, and it was one of the very few spicy dishes this cuisine embraced. They achieved heat by using finely ground peppercorns instead of chillies, which they didn’t have, but I couldn’t resist adding a few here for double pleasure. Pick the mint leaves into a small bowl of cold water to ensure they stay super-fresh. Trim and halve the spring onions across the middle, then finely slice lengthways into shreds and add to the water bowl. Get your fishmonger to prepare the squid for you or, if you’d rather do it yourself, simply watch the video below to guide you. Pat the squid dry with kitchen paper, then use a regular eating knife to lightly score the inside of the squid at ½cm intervals at an angle. Turn the squid through 180° and do the same again to create a criss-cross pattern. When you’re ready to cook, just under half fill a large sturdy pan with oil – the oil should be 8cm deep, but never fill your pan more than half full – and place on a medium to high heat. Use a thermometer to tell when it’s ready (180°C), or add a piece of potato and wait until it turns golden – that’s the sign that it’s ready to go. While it heats, tip the white pepper and flour into a large bowl with a pinch of sea salt. Add the squid, toss and mix to coat, then leave in the flour for a few minutes while you prick the chillies – if some are bigger, halve and deseed them first, then peel and finely slice the garlic 1mm thick, ideally on a mandolin (use the guard!). 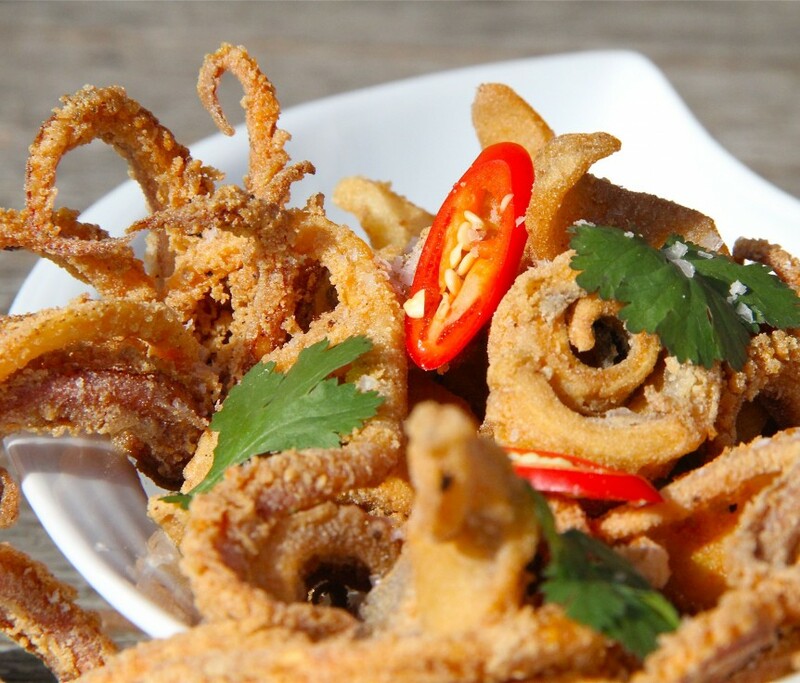 When you’re ready to fry, add half the squid and chillies – it’s important to cook in two batches so you don’t overcrowd the pan. When it’s all looking golden and lovely (after about 1½ minutes), add half the garlic for a final minute. Use a slotted spoon to scoop everything into a bowl or pan lined with kitchen paper to drain while you cook the second batch. Whip out the paper, then cut the squid into bite-sized pieces and return to the bowl. Drizzle with the vinegar, add a good pinch of seasoning, the drained mint leaves and spring onion curls, toss it all together and serve right away.